To understand details described in the story click the image to enlarge. © D.M.W. 1978 Woodard Racing Graphics Ltd. Between 1978 and 1982, within the landscape shown of the backstretch of Colorado National Speedway in the picture to the right, I experienced four life events I will never forget. The first of those events occurred near the pit tower shown close to the left side of the picture. This is where a fellow driver from Albuquerque, New Mexico, Shawkeet Hindi (The Flying Arabian), ran up over the right rear tire of another car and launched himself at least as high as the platform of the tower. I was somewhere back in the pack, and all I could see was race cars and car parts way up in the air. With that kind of action going on, I dove into the infield along with about fifteen other race cars. That of course created the biggest dust storm you can imagine. How we all managed to miss each other, all the track photographers, corner flagmen, ambulances, fire trucks, tow trucks, and other support vehicles remains a mystery to me. Shawkeet didn’t appear to be hurt much, but it later turned out that his vision had been affected so badly that he could no longer drive a sprinter. Look closely and you can see dirt clods still flying through the air. 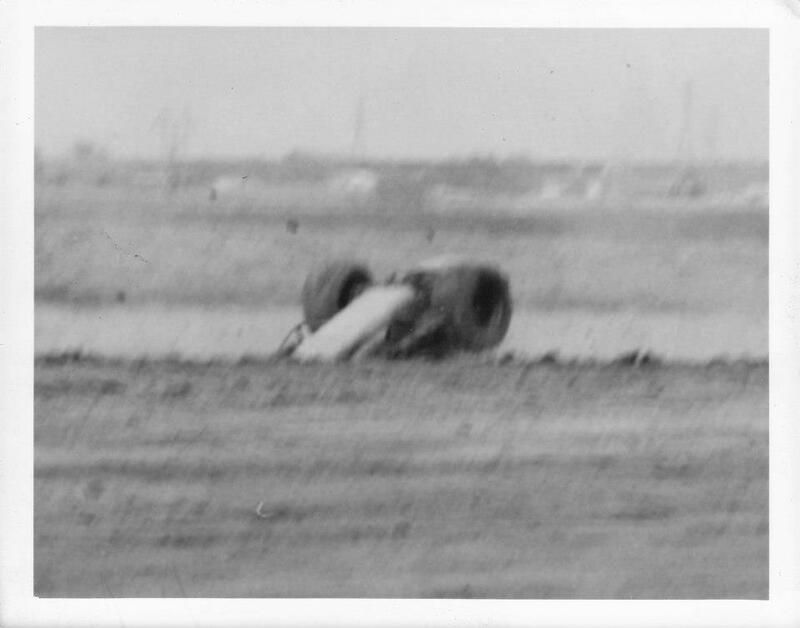 This picture was snapped from the infield by fellow racer Don Johnson’s father. Look closely at the far left side of the picture above and you will see a water truck exiting the pit area just beyond the pit tower. It was at about there that I pitched my sprinter into the turn (turn 3) and caught the right rear in a hole that had raveled out due to dry conditions. In those days it wasn’t unusual to run only three or four pounds of air in the right rear tire. It also wasn’t unusual for the tire to roll under the rim when one ran it into a hole, which is exactly what happened here. Tire goes in hole, tire rolls under rim, rim catches hole, up and over she goes! It’s really a rather simple concept. It was just a minor rollover, but somehow my shoulder straps were too loose and I cracked the tip of my shoulder blade on the seat top when I came down on the first bounce of the wheels. It didn’t take me long to scramble out of the thing though; the fuel cap had come off and I was hanging upside down with methanol pouring into my helmet – I got out of that thing about as fast as anyone has ever vacated a race car. Just to the right of where you see the small bleachers to the left of the left hand of the girl with the red helmet is where I had parked my pickup truck tight up against the catch fence one evening. Carolyn, me, and a friend named Tom Budde sat on the cab of the truck to watch one of the races take place. During the race, Scott Sauer managed to launch himself up over the right rear tire of a car he was attempting to pass on the outside. This occurred about where the tall pole is located in the picture. He tumbled along the very top of the fence a pretty good ways – passing us along the way. I still remember looking up at the sparks flying off the bottom of the car as it flew along the fence only six or eight feet away. It all happened so fast that Carolyn and I were frozen in position, but Tom bailed off the truck and sprained his ankle a little. Scott managed to wobble out of his racer unhurt, but came along a little later and got an aspirin or two from Carolyn. 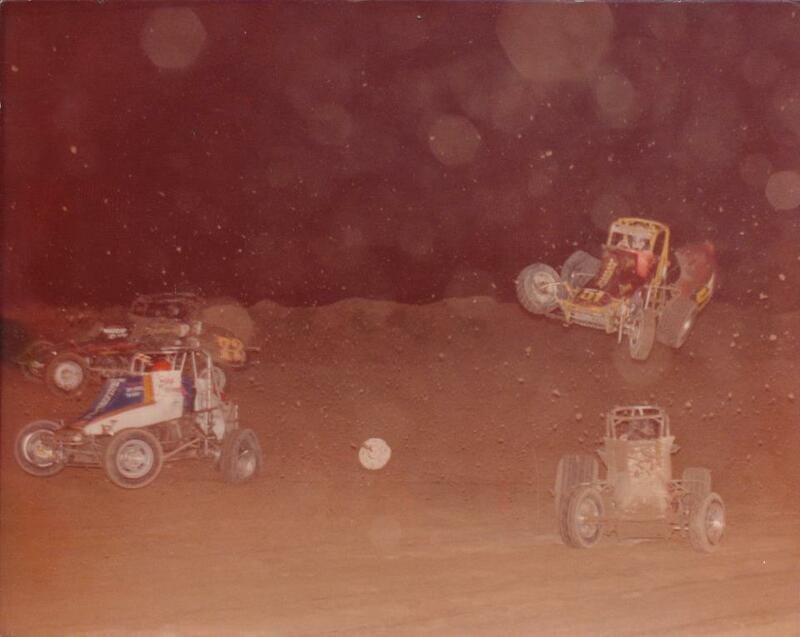 #72 Scott Sauer (left background), #4w me (left foreground), #51 Nick Losasso (in the air), #98 Layne Wright (sliding under Nick). Picture by Joe Starr, Track Photographer. About where the girl in the red helmet is shown in the picture above is where my car (blue white) is located in the picture to the right. The guy in the air (Nick Losasso) had run up over my left rear (see busted tire) flipped over the top of my roll cage, turning upside down in the process. When he was upside down over me, I still remember seeing his hands flung out beyond the cage (even though he had arm restraints on) – and I thought “Damn! I hope I don’t cut his hands off! Fortunately I missed him. He kept flipping once I was beyond him, and Layne Wright ran under him. Fortunately Layne missed him too. Nick was done for the night. Me too. Nick’s car was pretty much done for good.